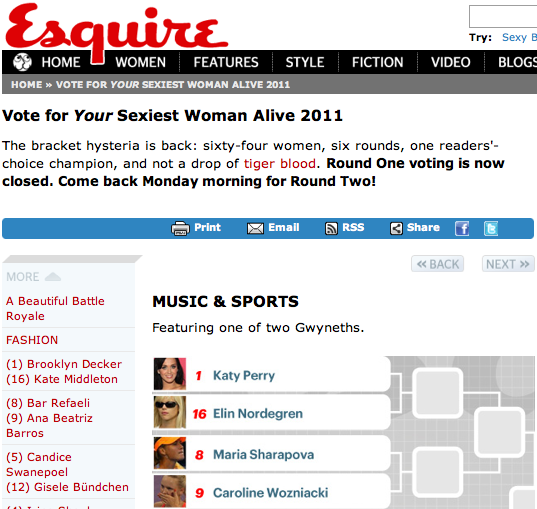 Third is charming, at least for Rog: While he may be the world’s no. 3 tennis player now, Roger Federer is still living the high life. Credit Suisse, one of his sponsors, has a whole page dedicated to the Rog. A Mario Testino photo shoot? Doesn’t mind if he does. But more importantly: is that David Ferrer holding the reflector? Geez, Rog really does live it good. Oh, how the weekend gets away from us: We certainly wish that we could spend our time wasting away in a coffee shop all weekend, but that never actually seems to be the case. A lovely lament from a real-life barista on Thought Catalog on why hipster barista give you an eye roll when you chirp out your order. Simon, singing: If you are still in love with the trashy brilliance that is Bravo‘s “Real Housewife” series, then you’re probably soaking up the first few glorious (hideous?!) episodes of the New York installment over the last few weeks. But here’s something for everyone … er, NO ONE. Simon, hubby to one Alex McCord, has a single. Yep, it’s called “I Am Real” and as far as we can tell, none of it is real. Or really him. Or really good, whatsoever. Patrick McEnroe‘s supposed response? Not. Happy. Tina Fey? Is, well, brilliant. Draw(n) conclusions: A few musings from the draw of the USTA Pro Circuit event in Dothan, Alabama. (1) Stephanie Foretz Gacon, once ranked as high as no. 63 in the world (now no. 145) reaches the final. (2) Michelle Larcher de Brito, once of grunting infamy, wins five games in a first-round loss. She’s still Portugal’s no. 1 gal at no. 174. No reports on how loud she is now that she’s outta the top 100. (3) Alexandra Stevenson, 12 years after her run to the Wimby SFs, wins two matches before bowing out in straights to eventual winner, Melinda Czink. Stevenson is now ranked no. 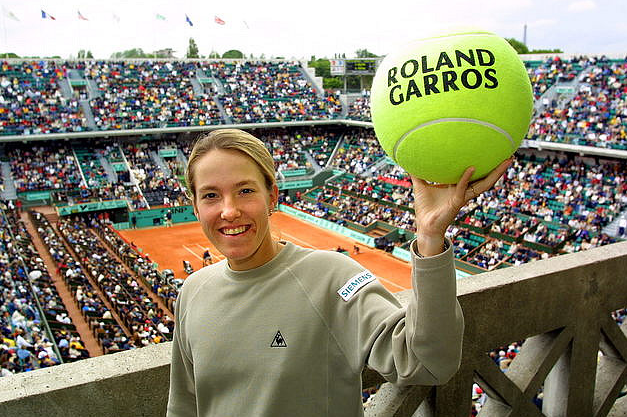 250 and has won one WTA-sanctioned match this year (compared to zero last year). (4) Americans were 8-9 overall, mostly thanks to Stevenson and a run to the semis by Allison Riske. Big props for DFW: The Infinite Jest author David Foster Wallace, who committed suicide in 2008, is getting rave reviews for his piece of work released posthumously, an unfinished manuscript called The Pale King. Melzer’s tour BBF? That’d be Philly Petzscher: Following his jaw-dropping win over Roger Federer in Monte Carlo, the ATP had Jurgen Melzer take FB Qs from fans. Our fave exchange is here: Question: Since you stopped wearing your White Adidas hat, you’ve gone on some great runs. Any coincidence? -Nick Leone, United States Melzer: Well… maybe! I thought I was practising really well without the hat so I was a little superstitious in Monte-Carlo, so I stopped wearing it and it went well. Until I start to have a losing streak, I will take the hat away. The many freaked-out faces of Klaus Goerges: We’re loving this video that Stephanie Myles of the Montreal Gazette put together of Julia Goerges father, using screen grabs from the TennisTV.com livestream. Click Klaus’ frowning face below to watch the whole hilarious thing. Feeling bi(coastal): Indian Wells is over, and it’s time to move on to Miami for some more fun-in-the-sun at the Sony Ericsson Open. But, before we leave Cali behind, how about news on the Serb we’ve been loving lately, Novak Djokovic? Not only did he thrash Rafa in the final set to take the title, word on the interwebs is Caro has been pining for him, at least symbolically. Move over, Ana – and longtime girlfriend Jelena Ristic – this lovely lady has the ranking and the sense of humor Nole just might be looking for these days. Or do you think he’d go for more of a Fiona Walker-type? Ballin’: Tonight several top players – Nole and Rafa among them – were taking to the soccer pitch for a fundraiser for the victims of the Japan tsunami disaster. If it looks anything like the boys playing a little soccer tennis last summer, we’re sad we missed it. World order, struck down: So while Novak’s getting the girls, the titles and playing some soccer for a good cause to boot, Roger‘s just plain losing – a lot. Ousted by the Djoker in a three-set semifinal showdown for the world no. 2 spot, Rog also succumbed in doubles with partner Stanislas Wawrinka. Fed suffered a “triple tennis blow” in Cali, says one piece. Now that’s one way to put it – and no, it doesn’t mean what you were hoping it did. 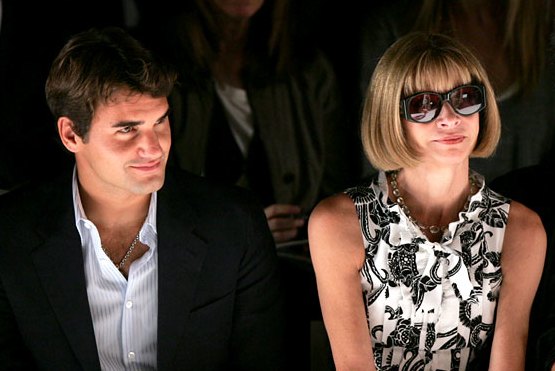 The Devil Watches Tennis: At least Roger has one Anna Wintour to comfort him. The Vogue editor is the subject of a much-talked-about Wall Street Journal magazine piece released online today. What is Anna doing in the lead image of the profile? Watching Rog – on TV. As if they needed an excuse: Boasting like it’s some sort of change of pace, Miami is getting ready for the SEO with music, parties and … well, tennis. Is that any different than any other time of the year? Our pick: Funkshion Fashion Week. Shows happen all week long, including the Masquerade Motel on Saturday night, a beach-front show that’s already been sold out. Little lady on the small screen: Dominika Cibulkova is being noticed for more than her small size (she’s just 5’3). For the entirety of the SEO, she’ll be a star on the online reality show Xperia Hot Shots, which is set to “follow the lives of six aspiring stars of the WTA as they try to build their Facebook fan base.” Says Domi: “It is so exciting to be part of this unique campaign … it’s a privilege to be just one of only a few girls selected for this.” While Cibulkova has 4,652 “likes” on FB, we’re curious: is that really her in the profile pic? Coulda fooled us. ”The Rock” takes on clay: Jim Courier’s now in charge of the US Davis Cup team since Patrick McEnroe’s resignation late last year. While McEnroe did a great job in his decade at the top (including a title win in 2007), we’re looking forward to what Courier brings to the table. 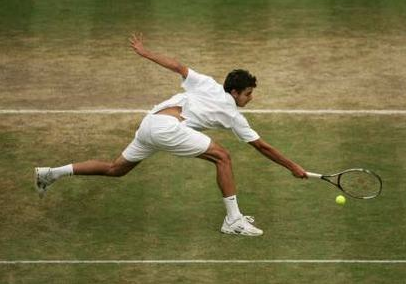 Aside from holding the top spot in the ATP rankings, Courier also helped his Davis Cup team to victory in 1992 and 1995. This could be key to getting the US guys winning again. That is, if they’re all still standing. (Get well, Sam!) Oh wells, at least we have Andy. First, the obvious. The match takes place in Chile and that means the play’s on clay. Sure, The Rock understands the stuff — he won two consecutive French Opens –, but the all-star team of Roddick, John Isner, and the Bryan brothers? Not so much. Second, the pressure’s on. With the Americans favored to win, that underdog mentality could boost Chile onto the second round. Don’t get distracted by the numbers, boys. It shouldn’t matter that they have no one ranked inside the top 150, nor that Fernando Gonzalez is still recovering from his hip surgery. Eyes on the prize! So take these reasons with a grain of salt if you must, but it’s going to be a compelling match-up regardless. Bone up: See all the tie details here. If it’s any consolation, Serena, you looked fabulous on those red carpets. We want that brown clutch! Tour breakdown: The clot raises a slew of questions for the form of the WTA tour, writes ESPN analyst Greg Garber. 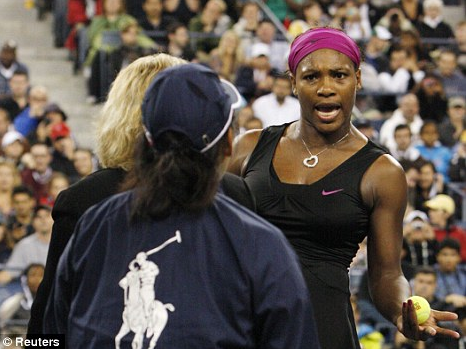 It looks like Serena’s feeling it, too, according to a recent tweet. We wish you a speedy recovery, Serena! Well, not all are broken: On a lighter note, former top WTAer Dinara Safina got some buzz by actually winning a match. In her 6-2, 6-0 beatdown of China’s Han Xinyun at this week’s Malaysian Open, Dinara collected her first victory since September. 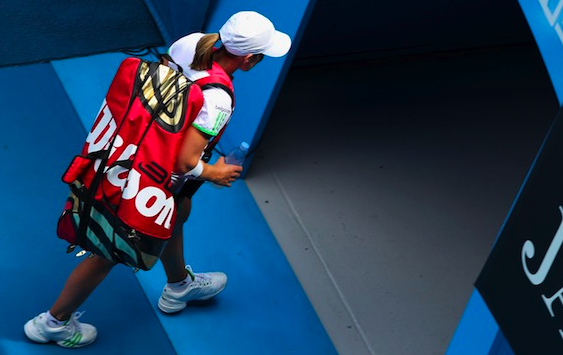 The question is: can she capitalize on the confidence and knock out perennial darkhorse Lucie Safarova? Presidential treatment: In the second installment of First Lady Michelle Obama‘s “Let’s Move” campaign, tennis is touted as a way to prevent and reduce the rates of obesity in American children. The clip also features the acting chops of Andre Agassi (as ball boy) and Steffi Graf (as Shimizo). Further reading: TSF’s Nick McCarvel writes it up for Straight Sets. Who wears short shorts? In a night of exhibition woes and old rivalries renewed, John McEnroe was leading Ivan Lendl 6-3 in their first-to-eight set match at the BNP Paribas Showdown before retiring with an ankle injury. In retro style, he sported his trademark “circa 1985” short shorts, as he told Patrick McEnroe in an on-court interview after the match. Andre and Pete also played… a better showing than their Hit for Haiti exo, don’t you think? Is something sketchy going on here? Columnist Greg Crouch thinks so. Taking her place on court is Victoria Azarenka. With Masha and Vika both on court, make sure to bring the ear plugs, Eugene. Pakistani dubs expert Aisam-Ul-Haq Qureshi is flashing his pearly whites (and wavy locks) in a recent ad with CloseUp toothpaste. Seriously, Rafa and Fernando, this dude is nipping at your modeling heels. He’s just going for a – er – cleaner approach. He’s not just a hot head, he’s also an art aficionado. Getting a custom-made sculpture in the process, tennis legend and New York City art collector John McEnroe took to the streets of Delray Beach against Mats Wilander in a game of street tennis as part of the “On the Ave” exo. Although Mayor Woodie McDuffie served as the chair umpire, it didn’t make Johnny Mac bite his tongue or keep the snide remarks at bay. He called Mayor McDuffie’s math “fuzzy” on his way to winning the TB 13-11. “I was down 2-1, and now I’m up 3-1; I like that. Is that how they count in Florida?” McEnroe quipped. After being honored with work from artists of the Milagro Youth Center, McEnroe said, “This is definitely unique. Anybody that knows about me knows that I’m a big fan of the arts. I’ve been a collector for 30 years since I first made money playing the sport I love… The greatest compliment I’ve received as a player was that I was an artist on the court.” But seriously, what is hanging over his headboard? Oh the things we wonder. Caroline Wozniacki has reclaimed the world’s no. 1 ranking after winning in Dubai over Svetlana Kuznetsova. Kim Clijsters nabbed the distinction from Caro for just one week ago. Kamakshi Tandon and Steve Stignor volleyed back and forth on their thoughts of the flip flop. Whether the system’s flawed or not, expect much more of the Caro-Kim ranking fight in the coming months, especially with Serena playing referee.